Since rubber first rolled on asphalt, driving has been a leisure pursuit. Cars are required for practical uses like getting to work, but isn’t the real reason we get behind a wheel to have fun? Science fiction fans dream of being astronauts, film buffs imagine being actors, and petrol heads grow up wanting to be rally drivers. Somewhere along the road, life gets in the way, but for the latter there’s a car that’s built for enjoyment that releases the inner-racer in all of us. The hatchback car has long been associated as a practical family car used for whizzing in and out of urban streets or nipping away from the city for mini breaks. The hot hatch (shortened from hot hatchback) is the cooler younger brother that looks stylish and always seems to have a good time. The hot hatch is the high-performance version of the car body and the term “hot hatchback” gained widespread popularity particularly in Britain in the early 1980s. While motor enthusiasts differ on what car was the first hot hatch, it’s generally accepted early versions first appeared in the 1970s. The shortened name 'hot hatch' first appeared in the UK motoring press in 1984 and since then the market for small and family hatchbacks with sportier performance has grown at terrific speed. With each passing decade up to the present day, the performance capability of hot hatches has increased but the running costs remain reasonably low in terms of fuel consumption making it a sought-after model among buyers. The hot hatch is also a favourite in the high-octane world of motorsports and it’s the twists and turns of elite rally driving that inspired Hyundai’s head-turning first foray into this market segment. The i30 N was launched in 2017 at the Frankfurt International Motor Show with the N brand placing emphasis on driving enjoyment. With its focus on fun, performance and safety, here are five reasons why your next car should be a hot hatch like the Hyundai i30N. The beauty of the hot hatch is that, as it’s a car to be used every day, it needs to be comfortable, practical, and inexpensive to run. But it also needs to set a driver’s pulse racing when negotiating narrow country bends. The Hyundai i30 N was built for driving pleasure. The car literally measures in heartbeats per minute along with revs. The i30 N has five different drive modes; Eco, Normal, Sport, N and N Custom settings selected through the car’s steering wheel. The i30 N prides itself on being race track-capable. Its development has been built on Hyundai Motorsport's years of successful involvement in the World Rally Championship. The N symbol itself is a depiction of a race chicane and also stands for Namyang, Hyundai’s global Research and Development Centre in Korea and for the world-famous Nürburgring, home to Hyundai’s European Test Centre where cars are developed and tested. As part of its development the i30 N racked up 10,000 km of driving on the Nordschleife at the Nürburgring circuit to test its durability. The Hyundai i30 N has made a big impression since its launch with many motor media outlets claiming it has bettered some of its established rivals in the market. This is seen as a major pat on the back for Hyundai in its first serious attempt at building a hot hatch. 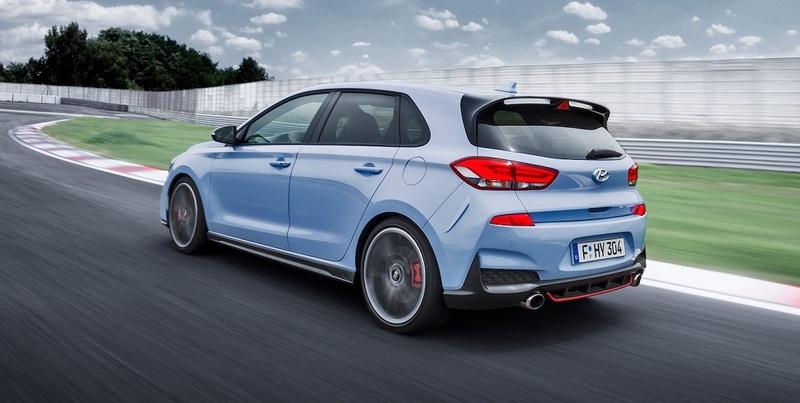 The Hyundai i30 N has also been hailed as a ‘game changer’. At its annual awards British car magazine Autocar named Hyundai i30 N a car that sets new standards in the industry. The judges lauded the i30 N’s all-round ability highlighting the car’s impressive performance and pure driving enjoyment. While hot hatches are built for race performance, their use as everyday vehicles means, just like in motorsports, there is no compromise when it comes to safety. Hyundai’s i30 N includes class-leading safety technology. Among its advanced features are Forward Collision-Avoidance Assist (FCA) which can issue alerts, automatically control the brakes and apply maximum braking force to avoid a collision or minimise damage. Intelligent Speed Limit Warning (ISLW) interprets road signs and translates directly to the i30 N’s internal displays. Other safety systems include Lane Keeping Assist (LKA) automatically correcting steering when needed and High Beam Assist (HBA) which maximises visibility of the road while travelling at night.